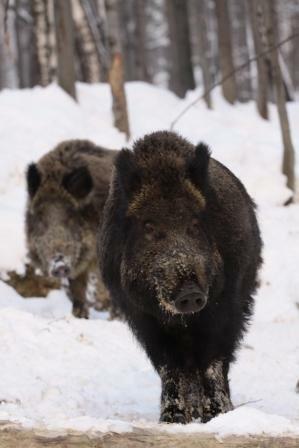 Wild boar, also known as wild pig, (Sus scrofa) It is the only representative of wild suidae in Europe. It occurs in almost all countries of Western Europe, South East and East. Natural range of occurrence does not include the north of the Scandinavian Peninsula, Finland and northern Russia. Boar is omnivorous. The body is compact, head is large, legs relatively short. The fur consists of stiff bristles and usually finer fur. Colour usually varies from dark grey to black or brown. 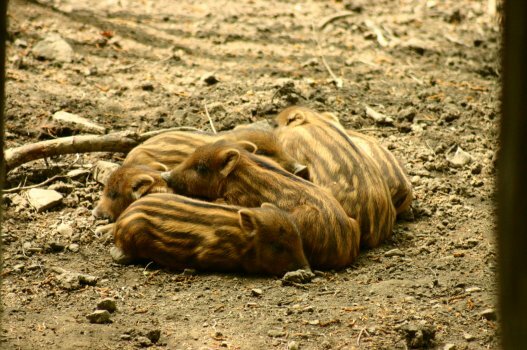 Piglets are coloured differently from adults, they have marbled chocolate and cream stripes lengthwise over their bodies. Stripes fade by the time the piglet is about 6 months old. Females and their offspring live in groups called sounders.